Janis Stirna presented a keynote at the 5th Enterprise Engineering Working Conference (EEWC 2015) in Prague, June 15-19, 2015, entitled “Capability Driven Development of Context-aware Enterprise Applications – Challenges, Approach and Experiences”. Slides available here. 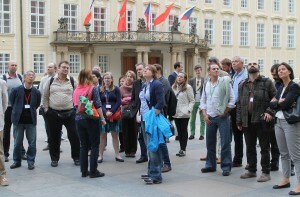 Above: EEWC 2015 participants during excursion to the city of Prague.